Over the last year, Preservation Leadership Forum has been taking a deep dive into how technology impacts and supports the work of historic preservation. From mobile apps and drones to interpretative tools and virtual reality, technology is critical to documenting, interpreting, and engaging with old places. A few weeks ago, we held a Forum Webinar about historical storytelling through technology, which featured three panelists: Sheila Brennan from the Roy Rosenzwieg Center for History and New Media, Lauren Northup from the Historic Charleston Foundation, and Jessica Marie Johnson from Johns Hopkins University. They described a variety of tools for telling stories that transcend expected and traditional narratives. Each panelist also sought to provide a few practical tips about how to approach technology out in the field. Forum members can now access a recording of the webinar, and we’ve asked our panelists to respond to some of the questions we were not able to address during the webinar itself. How do we leverage technology to expand the stories we are telling about the places we work to save? Brennan: Historic places have often been interpreted through limited viewpoints, but technological intervention can help amplify new voices. The stories that emerge as a result may not be as closely tied with a collection or a house—they may address the landscape, the neighbors, and even objects that are not part of the collection. This enables us to center the narratives of indigenous people and enslaved people, examine environmental impacts, and consider the cultural contexts of particular time periods. Northup: Technology such as Instagram expands our capacity to tell stories. Whereas in the past the scope of an exhibit was limited to its physical space, digital space allows us to incorporate stories from far and wide into our interpretation of Charleston’s history. Situating a particular site within the broad sweep of American or world history is compelling and easy to do using a digital platform. What are the different features of ESRI Story Maps and Omeka? What are the considerations involved in choosing a platform? Brennan: You should let your goals and audiences drive this choice. Where will visitors interact with this map? Is it something that you want them to use on a mobile device, or will they be seeing it in a blog post? StoryMapJS (which is different from ESRI Story Maps) allows you to tell a place-based story along a directed path set by the content creator—i.e., following a storyline that is dictated by maps. StoryMaps embed well in webpages, and the “slides” available allow you to add links and images to text. 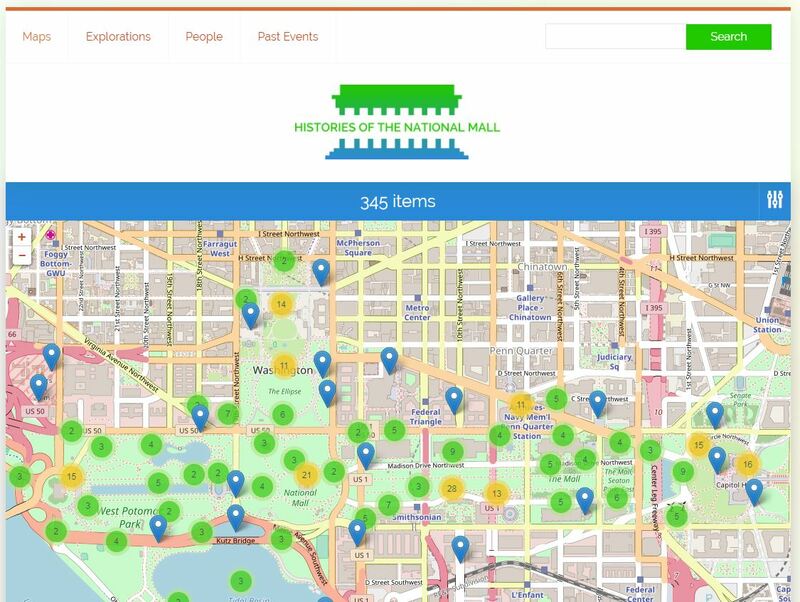 Omeka offers users a content management system for collections, and the items in those collections can then be used in multiple ways, including creating exhibits and maps. Mapping can help you tell stories or provide a gateway for navigating the content you have curated. The best way to determine what works for you and your projects is to take each tool for a test drive. How do you ensure that your content is preserved despite online hosting changes or link rot? Brennan: First, you have to decide the lifecycle of any project before you launch. Are you embarking on a two-year project; running a short-term social media campaign; or creating something that is integrated, and integral, to your organization’s web presence? Depending on the answer, and on your organization’s existing digital infrastructure, you may need third-party web hosting. If you are thinking about building a mobile app—something that needs to be downloaded from an app store—you have to keep in mind that, as mobile operating systems get updates, you will need to update your app. If you don’t have in-house staff to keep up with this evolution, you will need a contractor/vendor to do that for you. Northup: The Instagram account is primarily a “use now” tool—each post is designed to be read alone and for a single use, so concerns about link rot are not as pertinent. We have no way of knowing the longevity of the app itself, but we have partnered with app developer Cuseum in hopes that they will be nimble enough to navigate technological changes as they come. Where can organizations source images? Where can they store media? Brennan: Images can be sourced from your own collections as well as the from other cultural heritage institutions that have digitized collections with clear licenses for use. The College Art Association’s guide to fair use can be helpful. Media storage choices will depend on the type of project. For example, when building a mobile website, all the files will be stored on the server hosting the site’s media. What is the best way to deploy hashtags in an Instagram post? Do you find that hashtags are really useful? Do they garner large followings? Brennan: Tapping into popular hashtags may attract new users, but you need to start with some social media research. 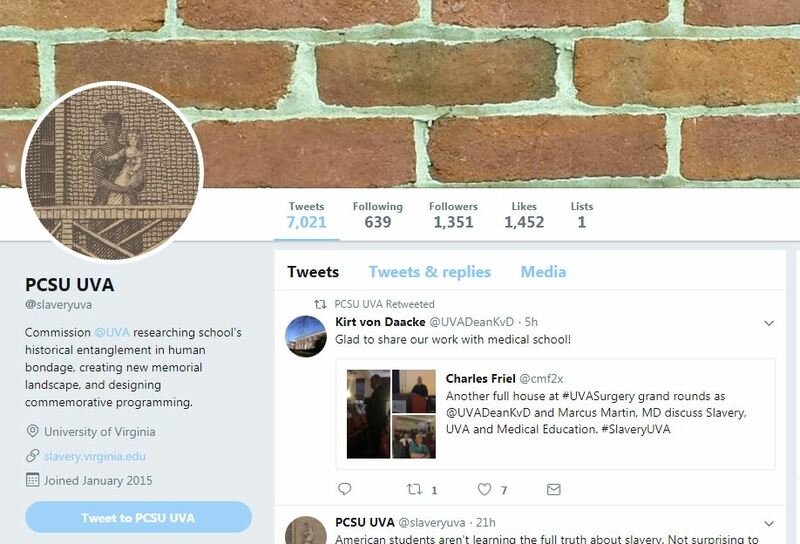 Find out what peer institutions are doing and what hashtags people in your feeds are using, specifically for conversations in that you would like to be involved in. The “Building Histories of the National Mall” guide to social media strategy and Hashtagify are both great resources. Northup: Hashtags can certainly be used to link to larger trends—e.g., the National Trust for Historic Preservation’s #TellTheFullHistory. And I always use basic hashtags on our posts to capture people who may be browsing #preservation or #charleston. Hashtags can also group together posts about specific projects, which is particularly helpful if those projects unfold over a long period of time. I’ve recently used hashtags to track our Russell House kitchen restoration (#russellhousekitchenhouse) and app project (#museumhacksHCF). But hashtags can also reflect personality and humor. The tone of the Historic Charleston Foundation Instagram is meant to be personable—it is intended to have a distinct voice. Given that the researching and writing are too time consuming for one person to realistically turn out two to three posts each week, I rely on other staff members to research posts and submit information to me; I then pull everything together and publish it in my voice. We consciously seek to be reverently irreverent—to celebrate Charleston and all of its history with a smile and a wink. (Though there are obviously many times when such an approach is not appropriate.) We seek to include and celebrate women’s history, African American history, LGBTQ history, and other underrepresented histories, and hashtags can add personality to these efforts. Any tips about getting algorithms to work with less popular posts that tell underrepresented stories rather than showing pretty pictures? Northup: We have found that, if you exclude exceptional events (e.g., the snow in Charleston, hurricane destruction—the images that people love the most), the difference in engagement between Instagram posts that are merely pretty pictures and those that challenge the standard narrative is relatively small. That said, we do try and always have a pretty photo to accompany a challenging narrative—which is, admittedly, fairly easy in lovely Charleston. We have found that using a pretty picture as a hook to draw people in to a story challenging the traditional narrative is generally successful. How do you measure success on social platforms? Traffic driven to website? Donations? Northup: There are multiple ways to measure success. We can track how many people download the app, which is a key indicator. We’ll also be tracking both visitor numbers and the success of the donation box—ultimately, this is still very much a gamble! 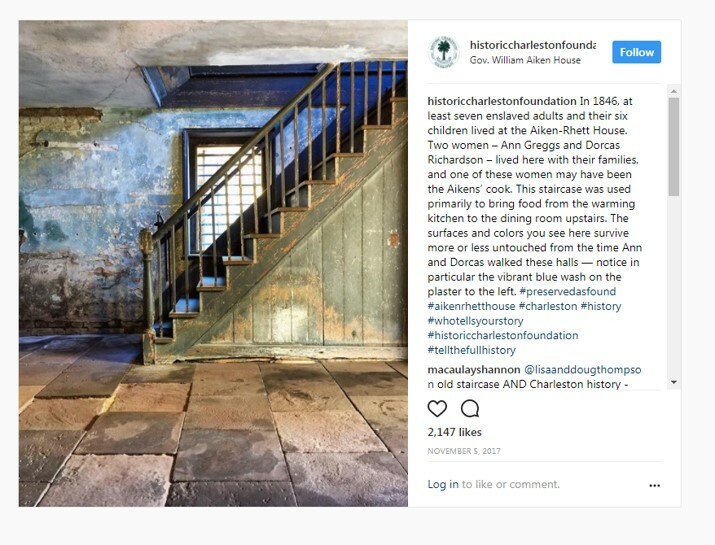 Did the Historic Charleston Foundation Instagram reach its current follower count organically or via some paid marketing? Northup: Our following grew organically—no followers have been paid or attracted via promotions. Our success is due to (1) our location in Charleston and the huge popularity of the city, (2) the use of beautiful pictures to celebrate the city, and (3) the use of other tools to encourage followers. As an example, a few years ago we held several “instameets”—special events that allowed participants to go behind the scenes at our museum houses and festival events in exchange for posting their experiences on social media. This garnered a large number of followers, and it grew from there. Photo contests are another strategy for attracting followers. How many times a week do you post to the Historic Charleston Foundation Instagram? Northup: We try to post most workdays around 9 p.m., which is the busiest time for our base. Of course, meetings and other work get in the way, but we probably average between two and four posts a week. We also don’t post unless we have something worthy of saying, which means sometimes we can go three to four days between posts. Quality rather than quantity, in other words. TrustLive: Technology. At PastForward 2017 Zenka urged audience members to collaborate with experts and think creatively about the role technology can play in our work in the years to come. Forum Journal. In addition to more from Jessica Marie Johnson, the forthcoming issue will examine virtual reality, digital documentation, and the broader implications for using technology in our work.